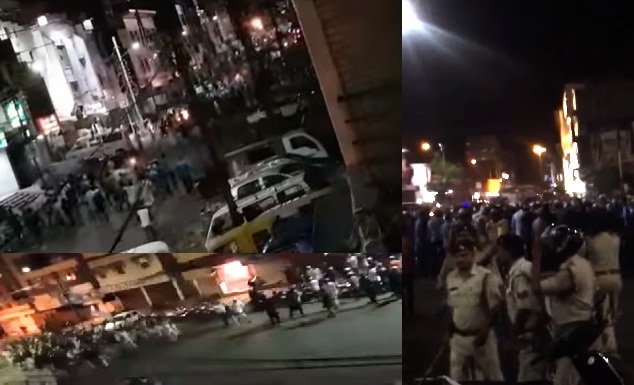 Bhopal: The old Bhopal city is sitting on a powder keg of communal divide and this was amply demonstrated late Tuesday night (30 May 2017) when communal clashes erupted in certain nearby areas after a social media message, especially on Whatsapp, went viral stating that a religious structure inside the Hamidia Hospital complex had been damaged. Rampaging mobs indulged in large-scale stone pelting and torched over a dozen vehicles by the time police had gathered in full force to bring the situation under control. A large number of STF and RAF personnel were deployed to quell violence. The Police fired in the air and lobbed teargas shells to control the violent mob. At least three security personnel are reported injured. According to a police sorce, a crowd from a particular community that had gathered near Hamidia hospital was engaged in a bloody clash with members of another community at Peer Gate. People had come out in large numbers and all roads from the newly built cable-stayed bridge at Kamla Park to the Shahjehanabad area were filled with agitated mobs after the word spread about the religious structure at Hamidia Hosptal. Later around midnight, Bhopal DIG R.S. Sikarwar told media-persons that the situation had been brought under control and the community leaders have been asked to come forward and help in restoring peace. Meanwhile additional police force from Sagar, Gwalior and Indore had been called to augment the security arrangments and tackle any eventuality in the State capital, which was once described as an “Island of peace by late Sunderlal Patwa when he was the chief minister of Madhya Pradesh. Soon after that Bhopal had witnessed one of the worst communal riots following the demolition of the Babri Masjid structure in December 1992. The Patwa Government was dismissed in the wake of the post-Ayodhya riots that had engulfed even other cities of Madhya Pradesh. the devils of division are doing thier jobs efficiently… Citizens from civil society must rise to condemn such acts of violence and hatred…… Whatever faith he or she may belong to, every one must do his orher bit t to de-escalate rising tensions before they can actually occur………The CM, the Home Minister and all the law and order forces in the world will not be able to quell mob violences if Citizens do not react….and engage in constructive bridge making efforts to link opposing groups or communities… Being a Citizen means assuming responsibility for every other Citizen…..for every other human being……..